Making the transition from an office-based to a home-based job is not only for those who’ve had experience doing online work. Even beginners can successfully work from home, given the right degree of preparation and patience. Below is a guide on how to make that crucial first step to making the change. Employers get dozens of applicants on a single job post, and they won’t have the time to go over each application thoroughly. Set yourself apart from other applicants by having a ready portfolio where you can showcase your skills and talents in just one click. If you’re into writing, you can publish your works at article directories like EzineArticles, ArticleCity, or GoArticles. For photographers and graphic designers, you can take your pick from Flickr, DeviantArt, or Coroflot. Vimeo is a favorite for those into motion graphics. You can also set up and maintain a blog focused on your field of expertise. However you choose to showcase your portfolio, the important thing is to make it easy for employers to view your sample works. Popular websites offering home-based jobs are oDesk and eLance. Familiarize yourself with the way things work at these sites. Check other contractor profiles and take note of what you liked about their profile. Keep everything simple and professional, highlighting your main skills and relevant experience. Provide a link to your online portfolio. You may also have to take certain tests in various fields (e.g. English, Customer Service, MS Office) to improve your chances of getting hired. Always treat each job application differently – cater your cover letters to the position, and pay attention to instructions in the job post. You may need additional items to get you ready for online work – a good headset and microphone, an upgrade in your current internet service, software applications that allow you to make voice calls, or more memory space. Once that’s in place, be sure you set up your workstation in an area with less distractions and minimum clutter. Because you won’t have someone standing over your shoulder to see how you’re doing, chances are you could slack off. Keep a schedule of your working hours and try to stick to it. Treat yourself as your own employee, and set deadlines and rewards for accomplishing them ahead of time. If you tend to visit non-work related sites, you can download add-ons that block those sites during work time. One good tool is Leechblock, if you’re using Mozilla Firefox as your browser. If a job listing looks too good to be true, it probably is. Think twice about parting with your money as a requirement to get started working online. Get-rich-quick online businesses are also something to avoid. Most job sites screen employers as an added measure. Verify the employer’s identity, check feedback from previous hires, and browse through his previous job posts. 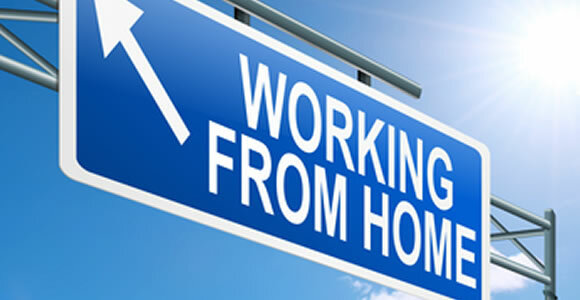 Landing a work from home job is not an impossible task. It just takes a certain amount of patience and determination. With workers from the rest of the world vying for the same position as you, you can position yourself one step ahead by having an impressive profile and portfolio. Once you’re hired, it’s up to your innate drive and willpower to keep you ahead of the pack.